When Evangelical Alliance member Neil Douglas followed a sign to a church in an art centre in Brisbane, Australia, he didn’t know God would eventually draw him into a relationship through Christ Jesus and later use his paintings to encourage people to deepen their fellowship with Him through prayer. In this interview, the British painter shares how he experiences God through art, the mission and journey of his series of Holy Spirit-inspired paintings, ​‘Amen’, and talks powerfully about fully trusting and relying on God with his move into faith-based art, despite the challenges. “As faith becomes an increasingly significant factor in my life, I am working on a few rough sketches around the practice and intimacy of worship.” These are your words from one of your previous interviews. These rough sketches became five paintings, the beginning of your first faith-inspired series, ​‘Amen’. How did you move from being a non-believer to painting people while praying? I’d been searching for faith and God for a while before I became a Christian, and my paintings depict that. I used to paint quite dark city landscapes, but then moved on to painting the natural environment. I painted Brisbane’s Jacaranda trees and blossoms, which symbolise new life and relate to resurrection. I perceive moving on to painting nature a result of my search for answers around mortality, resurrection and new life. One Sunday, while walking to my studio in Metro Arts Centre in Brisbane, I felt like I should go to church. Just as I entered the building, where my studio was, I saw a sign ​“You should go to church.” It was pointing down to a new church in the basement of the building. I went in and my journey towards accepting Jesus as my Lord and Saviour started there. After becoming a Christian you could’ve continued painting dark scenes and nature, but you chose to move on to faith-related topics. What inspired this? I was in Brisbane and was spending a lot of time in the studio prayerfully asking God what He wanted me to do going forward. I’ve never been a person of words or fine preaching, but I have a talent to paint. I felt that God said I should use the skills I already have to spread His message. How long after this did you decide to paint ​‘Amen’? One Sunday during the worship, I opened my eyes and saw people praying. It was so amazing to see them all praying in different ways but all raising their voices and hands to one Father. After the service, I spoke to a few people and told them about my idea of capturing their moments of prayer in paintings. They were all supportive. So, one Sunday, after the service, Neil Kumar, a photographer who’s been part of the project, and I took them to a quiet room in the church and took a series of photographs while they were praying. We captured them from different angles, in different lights, etc. I then painted from the photographs. How different did it feel to paint people you knew in their intimate moments of worship and prayer to painting blossoms and city landscapes? ‘Amen’ felt very spiritual – it was almost like a form of a prayer in the studio. These paintings feel very much guided by the Holy Spirit. When I was painting them, it almost felt as if I were only holding a brush and someone else was painting. I can’t even remember some of the moments when I painted them. They also brought deeper satisfaction than before: they all give me that warm feeling inside. It’s a feeling I am where God wants me to be. Why do you think God put these paintings on your heart? What message do you want to get across? ‘Amen’ is about portraying prayer and getting people to reflect on it. I want the series, which I’m hoping will include about 20 paintings, to be exhibited in as many places and reach as many people as possible. However, if only one person stands before the paintings and thinks: ​“I wonder, if God listened to them, could He listen to me too?”, the purpose will be complete. I’m not here to get involved in heated debates with atheists – there are others who can do that better. I’m here to give a testimony through my paintings. When a blind man in the gospel of John was asked about his healing and who’d healed him, he responded by saying he didn’t know the details, but he knew he’d been blind but now he could see. I’m the same: I was blind but now I see, and I want to show that using the skills God gave me. Have you got a sense that this is the God-given talent and you should use it for His glory? God put the skills in me before I even knew He existed, and they’ll bear fruit for His glory. It’s part of me that cannot be separated anymore from my art. Alongside ​‘Amen’ I’m working on some London landscapes, but even then, I can’t separate my faith from my paintings. When I became a believer, my worldview changed. If I didn’t make a reference to my faith in my work, it would be like telling an incomplete story. Do any of the paintings from the series stand out to you in any special way? They’re all special to me, because I know the people I painted, but the one that stands out is of the young boy, Jireh. We spoke to his parents and explained the idea behind the project. When it came to photographing him during the prayer, his dad explained to him what we were doing. The boy started praying straight away and it was such a pure prayer. It was such a humbling experience to hear him pray. He prayed as if he were talking to his friend. It was a perfect picture of the ​‘childlike’ faith that we’re called to have. Were people’s reaction to your newfound direction different to your previous paintings? When I came back to the UK, where most of my family and friends aren’t believers, most of them told me that I would be committing career suicide if my paintings reflected prayer and Christian faith. I found their comments shocking. Funnily enough, though, ​‘shocking’ is so popular in modern art, but faith, somehow, doesn’t fit into that. The gallery that represents you also had objections about displaying your work, despite the fact they’ve displayed your work before and know your value as an artist. What was your reaction to that? We had an open conversation about it. The manager of the gallery was honest and told me that he didn’t think he’d be able to sell my ​‘Amen’ paintings. The world of art is commercialised, and gallery owners need to earn money by selling the paintings. If they don’t think they can sell paintings, they are not interested. It’s not too much of a worry to me, though. I know God will take care of it. If He put something on my heart, He’s done it for a reason and will not leave me now. With the gallery, we’ve agreed that I’m free to exhibit the works in other places and they’ll still support me and help with the technical side, such as transporting the paintings, hanging them, etc. Do you think that the gallery owner’s attitude is part of a wider challenge Christians face in growing secularisation? It is probably a sign of the times, especially for Western cultures. As an artist, I want to show my identity in my work, and I’ve tried to show that aspect to the gallery; they tried to understand it, but commercial thinking is really powerful. As an artist, I need to understand that too. I need to sell more to produce more, but I need to also stay true to myself, not just to the market. But, I want to stress that, it’s never been that much of a worry to me, even in the conversation with the gallery. I have faith in God and He’ll direct me wherever He wants me to go. Your trust and faith in God is an amazing example to fellow believers. Did you trust God straight away with these paintings or did you have some hesitation? I have been able to trust God completely with these paintings. In a way, these pieces have given me the chance to put the role of the artist on the sideline and keep the focus on Him. Throughout the series I see the humility of each model in their approach to prayer, which serves as a reminder to me that all I do is not of my own hand. Everything I have is a blessing from God; the Spirit energises and motivates, I just have the honour of holding the brush. Has it been easy to exhibit this series so far? The venues we spoke to have been positive, but all the talks, like the whole series, are in an early stage. I want to have most of the series complete before exhibiting it. Most venues have exhibitions scheduled 18 – 24 months ahead, so hopefully this time next year, I’ll be able to share more details about exhibitions. We’re also speaking to publishers about turning the series into a book with paintings and statements about prayer from those who are portrayed in the paintings. Can you see your work exhibited by churches? We may exhibit in some churches. After all, they seem a natural environment for these paintings, and I’m sure the outcome will be very positive. But I want to reach people outside churches, so the message of this series gets to a wider audience. I want the paintings to spark conversations about prayer, and that may not be possible everywhere. Has ​‘Amen’ encouraged you to go in the same direction in the future or not? I feel more confident talking about my faith now. A lot of contemporary Christian art will show idealised views of the heavenly things, but I’m keen on something different. I haven’t personally met any Christian painters. What kind of a personal journey it is for you to be an artist and a Christian? There’s definitely an element of struggle; I would be lying if I said there wasn’t. I grew up in an environment hostile to God, so when I came to faith, people asked a lot of questions. But I remember praying once and having peace inside. I realised that there are things I’ll never understand, but despite all that I can be myself and God loves me. I know God is looking after me and I can enjoy the gift He gave me. When I realised that, I felt that a huge weight lifted off my shoulders. Before I became a Christian, I wasn’t fully satisfied with my work. I thought that if I spent all the time in the studio painting, I would feel satisfied, but I wasn’t. With ​‘Amen’, I feel I’m in the place God wants me to be. Writer and blogger Joanna Sopylo-Firrisa has worked as a freelance journalist in Poland and has written for various media in the UK. 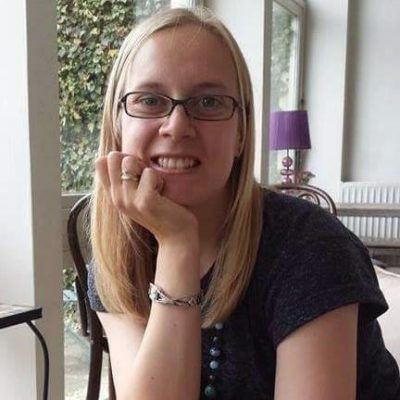 At www​.good​goodlife​.co​.uk, Joanna blogs about faith and everyday life.